We now have a hydrotherapy service that will be taught by our experienced Physiotherapist Lisa Barbieri in semi private groups at Menai Swim Academy. Hydrotherapy is beneficial to a variety of people including those with osteoarthritis, chronic back, neck and shoulder pain, pre and post orthopaedic surgery, balance and coordination problems, rheumatoid arthritis and sports injuries. 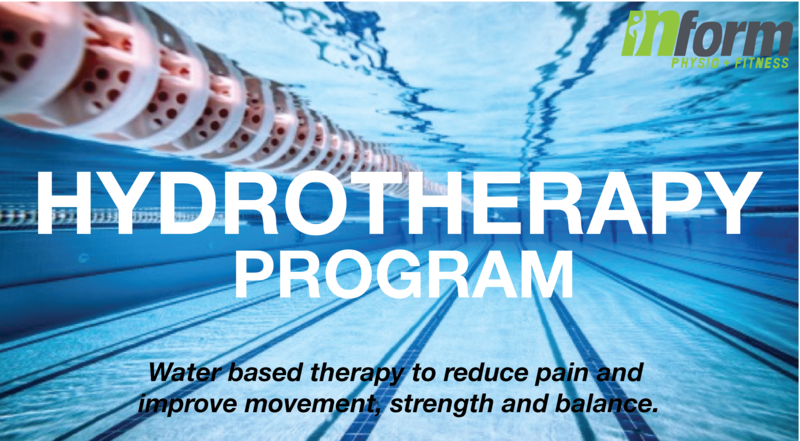 The water based therapy reduces the weight bearing load and therefore allows for patients to perform a larger variety of exercises to improve strength, range of motion and balance. This can be ideal for people who need to offload an injured area. Numbers are limited to 4 per class to ensure you get the required care to reach your goals and get you back inform for sport, work and life. If you are interested in hearing more about the Inform Physio + Fitness hydrotherapy service or for bookings please call 9543 1888.